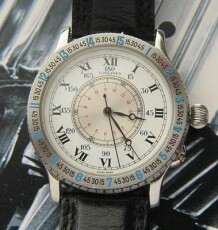 Rare dial Cartier vintage Tank model. 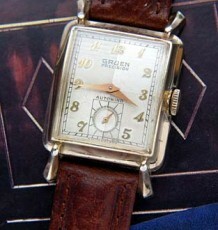 Has the unusual Cartier tri-gold dial similar to the Tri-Gold ring sets that Cartier makes. 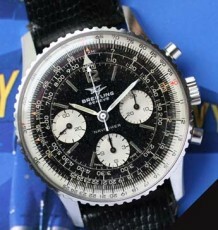 Comes on genuine Cartier dark blue lizard strap and gold filled buckle. 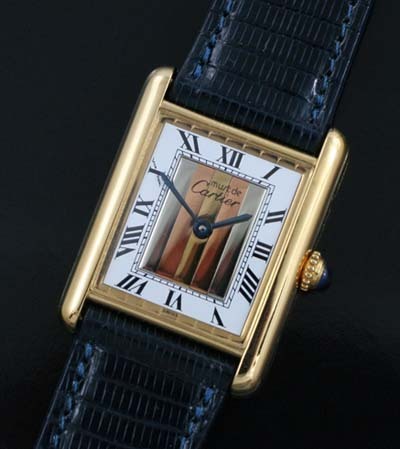 A vintage Cartier Vermeil Tank watch with a stunning multi-coloured dial. The centre of the all original dial is an uncommon pattern which resembles the famed tri-gold rings that Cartier is well known for. The case is crafted in solid silver then gold plated, thus being called Cartier Vermeil. 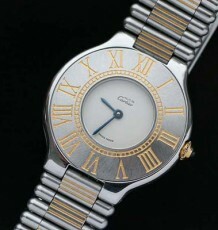 The watch is fitted with the genuine Cartier high quality quartz movement. Please note the original sapphire crown and the brand new dark blue Cartier lizard strap fitted to the watch. This elegant watch measures 23.5 mm wide by 31 mm long.